On the 29th of June each year, the 14 countries of the Danube Basin jointly celebrate one of Europe's greatest river systems and the people and wildlife that rely on it. In 2018, over 200 events took place across the Basin in the weeks either side of Danube Day. Read on to find out how you can get active for healthier rivers and enjoy the 2019 celebrations in your country! 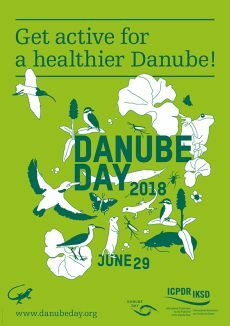 Get active for a healthier Danube! Danube Day 2018 was a celebration of healthier rivers following 24 years of ground-breaking international cooperation. Riverside festivals, public meetings and fun, educational events paid tribute to the Danube rivers, their peoples and the progress being made. Events took place in Germany, the Czech Republic, Austria, Slovakia, Hungary, Slovenia, Croatia, Bosnia-Herzegovina, Serbia, Montenegro, Romania, Bulgaria, Moldova and Ukraine. Such events strengthen our "Danube solidarity": in spite of different cultures and histories, we have a shared desire and responsibility to protect our precious resource. Read the ICPDR Danube Day press release to find out about the unique 14-country partnership that's active for a healthier Danube. How people use, enjoy and cooperate over their rivers is directly affected by the events of Danube Day. Festivities take place throughout June and into July. Check the events pages in spring 2019 to find out what's happening in your country and internationally. In the meantime, you can read about the 2018 celebrations on the 2018 Review and country pages or see a list of the events that took place across the Basin. Plus, if you can't wait to get active for the Danube rivers, you can try out the Danube Adventure Game now!